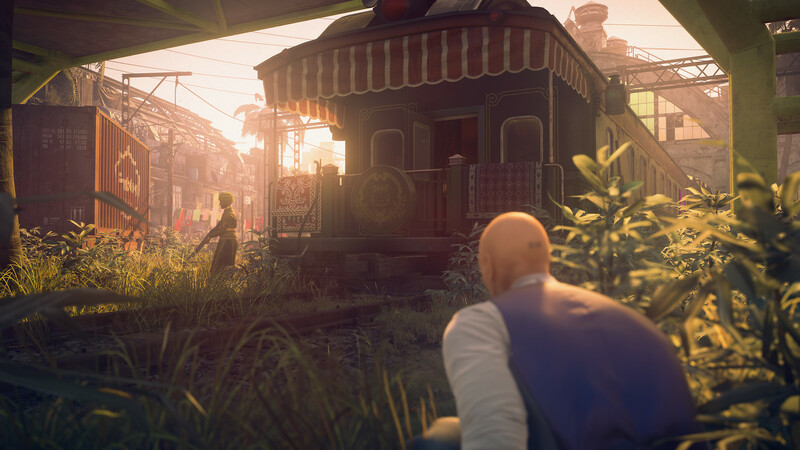 “Smart” isn’t a word I’d often use to describe a triple-A game, but in the case of Hitman 2, it absolutely fits. Almost 20 years since the series’ debut, the concept of a stealth game built around hiding in plain sight is as genius as ever. But it’s the game’s wry sense of humour and subversion of both AAA games and spy films–both of which Hitman 2 unapologetically draws upon—that makes it so much more than another blockbuster action game. 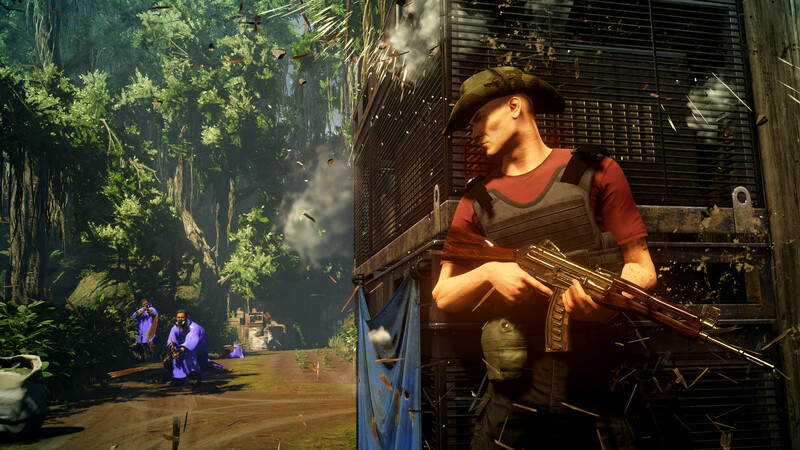 Hitman 2 picks up right where last year’s reboot left off, so if, like me, you haven’t played that one, it can be confusing to figure out how all the different narrative pieces fit together. It does all come together in the end, but frankly, the overarching story isn’t particularly memorable in its own right. Rather, it perfectly sets up a game that feels like a TV procedural approach to a spy film: each new mission is a new episode, with its own mostly self-contained story and its own targets to take out. Your role in all this is as Agent 47, an emotionless, methodical hitman whose generic face allows him to easily blend in anywhere. 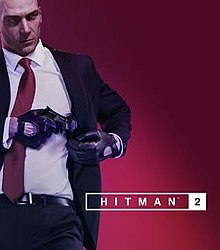 At its heart, Hitman 2 is a stealth game, but instead of hiding in shadows and quietly picking off unsuspecting guards, it’s all about using disguises to get close to your target and take them out with as little collateral damage as possible. Stealth games are always a sort of puzzle, and in Hitman‘s case, it’s all about acquiring new disguises and exploring the new options that each new getup opens. You won’t get far into a drug lord’s hideout in Agent 47’s usual suit and tie, but dressing up as a guard will at least get you through the front door. That won’t be enough to fool the target’s personal security, but their personal familiarity doesn’t extend to the cooks and cleaners; masquerade as one of them and you’ll have near free run of the mansion. Even when your disguise gets you close, an unnoticed kill and quiet getaway are another challenge. Targets rarely have a moment alone, so just sneaking in and quietly strangling them is almost never an option. 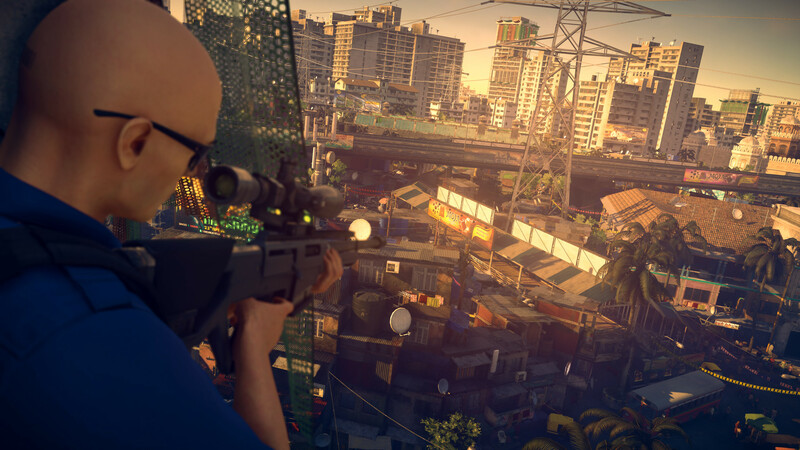 Instead, Hitman 2 is all about carefully planning and setting up the kill—creating the opportunity that the game isn’t just going to hand over to you. Sometimes that means forcing some alone time by disguising yourself as someone of particular interest to the target. Sometimes that means staging an accident. Sometimes, if you’re feeling old fashioned, it “simply” means smuggling in a sniper rifle and lining up the perfect shot—though this is almost always the more difficult route. Coupled with some spectacular level design, this leaves the door wide open for some creative puzzle solving. Depending on your approach, a single mission might take a couple of hours as you scope out the situation, plan your approach, and then execute it piece by piece. Almost all missions have multiple targets, with myriad ways to take out each one of them. You’ll never see everything a particular level has to offer on your first time through, and a lengthy list of challenges for each map encourage repeat playthroughs that try new approaches. Though each level is, by design, a playground for you to see out your secret agent fantasies, this setup also lends itself to some fascinating internal storytelling. Like I said, each new mission is mostly self-contained, with an opening cutscene to introduce the targets and give you a rundown on why it is you’re being sent to kill them, but that’s only part of the picture. As you make your way through the level, the little environmental details and idle chatter you overhear all work add texture to the world and context to your assassination targets. This is most apparent in the “Mission Stories”, brief side quests of a sort that work both as narrative vignettes and breadcrumb trails to help you get closer to completing your mission. Generally, these Mission Stories aren’t readily available until you stumble upon them by overhearing some conversation or uncovering some noteworthy intel. By following that lead, you get to learn more about your target and the world they inhabit. Mission Stories also offer a more structured style of play than Hitman‘s usual sandbox. Once you’ve uncovered one (and if you’re playing on Casual difficulty, all Mission Stories are uncovered from the outset), you can follow a series of short-term objectives in a manner more reminiscent of your typical AAA action-adventure game. Some such stories will guide you all the way to a kill; others will help you gain access to new places or disguises that would be much harder to obtain with the traditional route. These stories are optional, of course, and you’ll never see the full potential of the game—let alone complete the myriad of challenges within each level—by following Mission Stories alone. But they’re a good way of easing yourself into Hitman 2‘s style of play and planting ideas for what you can do with the full sandbox. For a series that can be daunting to newcomers, it’s an elegant way to make things more approachable without dumbing the whole thing down. As well as grounding helping to flesh out its characters and ground the game in some context, Hitman 2‘s world-building is also the source of much of its sense of humour. Despite the seriousness of Agent 47 and the main plot, the game constantly pokes fun at itself. 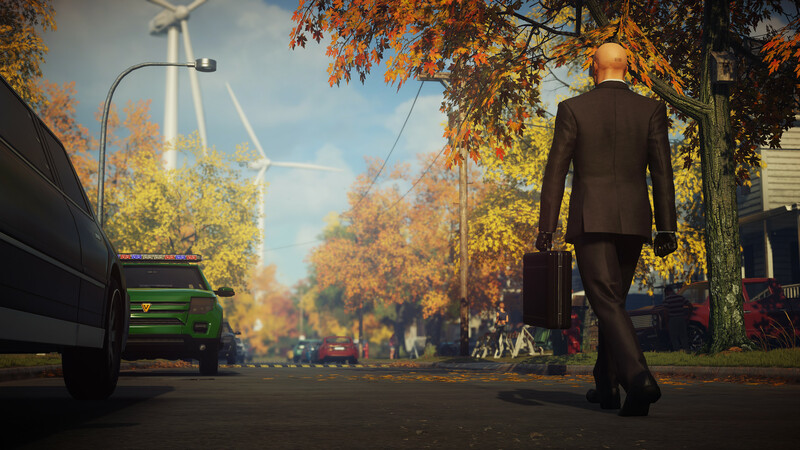 Agent 47 is an expert marksman and a man of many talents, but his most useful trait is being a generic white guy—the default video game character—who can, as a result, easily blend in anywhere. The disguises themselves often lean toward the ludicrous; even when there’s context, seeing a deadly serious hitman dressed up as a festival mascot or drug-addled hippie is always a funny sight. Hitman 2 also takes its share of jabs at the blockbuster industry more generally. Sometimes it’s with subtle, like the juxtaposition of the usual spy action against you selling cupcakes and showing off a house in American suburbia. Sometimes it’s a blunt instrument, like a whole Mission Story built around trying to steal an ancient treasure from one Blake Nathaniel and having to listen to him recounting stories of his ridiculous adventures. Even the very setup of the game is its own quiet satire of blockbuster games’ usual unthinking violence: this is a game where killing anyone but the target isn’t just nominally discouraged (or treated as some extra challenge), but is baked right into the framework of the game systems and the ethos that drives them. This is why I say Hitman 2 is a smarter game than most. Its core concept of stealth by hiding in plain sight is clever in its own right, but it’s the way that design becomes a vessel for self-reflective humour and a satire of blockbuster games in general that makes Hitman 2 a work of genius.